**Update DEC. 2009 — This story won Honorable Mention for Sports News or Feature Writing in the Maryland-District of Columbia Scholastic Press Association’s 2009 Individual Writing and Editing Contest Awards, Newspaper Division. “You are academically ineligible.” Variations of this phrase are spoken all across the nation to very talented athletes. Countless seasons have been derailed by intricate players not meeting the expectations of the school’s academic standards. In the past, those that couldn’t make the grade in private school resorted to continuing their careers in a less rigorous public school academic requirement. Now, due to the “no E” policy put in place by public school, there is no escaping fulfilling a certain requirement in order to enjoy the privilege of participating in extra curricular activities. Ironically, private school standards have become easier to maintain academic eligibility. Many of the schools within the conference, including the Mustangs, allow up to two failing grades on the report card as long as the student’s GPA has met a certain standard. These college preparatory schools have come to realize that the pressures and abundance of responsibility placed on these students could be overwhelming and in turn cause slightly uncharacteristic, academic performance. However, they never lose sight of the first priority which is educating the mind. That is why an academic probation system is put in place. Regardless of how entertaining, and in some cases profitable, the success of the team could be for the school, there is an always present interest in being able to perform in the classroom. This interest is often forgotten by the fans that enjoy seeing their favorite high school athletes. 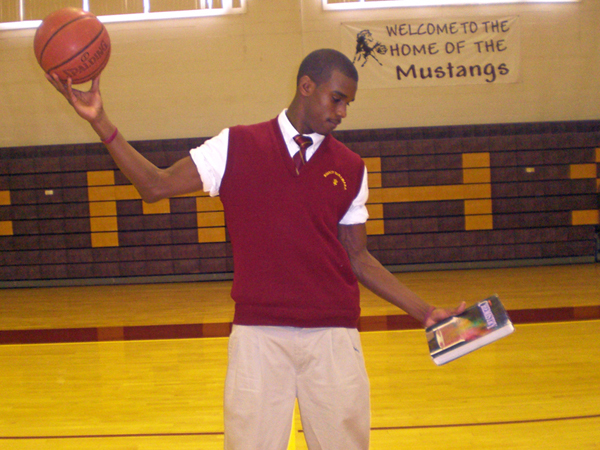 Student athlete Brandon Coleman ‘10 illustrates the struggle between the gymnasium and the classroom. McNamara requires a 2.0 grade point average with no more than two failing grades. When a student has not met these requirements, they are prohibited from participating in practices and games for the next four weeks. If an individual’s grades have improved after the probational period, they are cleared to begin playing and practicing with the team. What about those students that fail to meet the academic standards during playoffs? Principal Marco Clark says, “There are definitely exceptions. He or she has played the whole season long and it would really hurt the team.” However, these players are not off the hook that easy. They must display commitment to improving and maintaining their grades even after the season has come to an end. All around the WCAC, the academic standards differ. Some have adopted the “no failing grades” policy similar to PG. public schools. Others have lowered the minimum grade point average for freshman and have made it easier for the students to raise their grades as they progress in years and academic maturity. This raises the question, should freshmen be expected to perform at the same level as a senior? It is sure that everyone has experienced or is currently experiencing the huge change from high school to middle school. Freshman athletes usually have a tendency to lose sight of the goal, which is education. A junior or senior has experienced the pressures of a full season and know what they must do in order to remain available to their team mates.